The stem ginger and cherries make this fudge a deliciously appetizing treat, and great homemade seasonal gift! Heat the milks, sugar and butter in a large, non stick saucepan over a low heat, stirring until the sugar dissolves completely. Bring to the boil and simmer over a low heat for 10–15 minutes, stirring continuously and scraping the base of the pan, until a soft ball of fudge is formed when a little of the mixture is dropped into a jug of ice cold water. Remove from the heat and beat the fudge by hand until thick and grainy (about 10 minutes). Gently stir in the remaining ingredients. Pour into the prepared tin and leave to cool before cutting into squares. This is fab fudge - goes down a treat. Could someone tell me how long this fudge lasts for please? Hi Suze, this fudge will last for up to 3 weeks if stored in an airtight container. 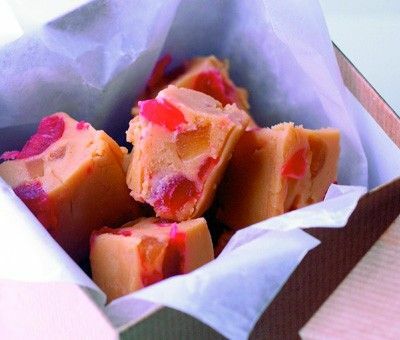 Ginger and cherry fudge is rated 5.0 out of 5 by 4. Rated 5 out of 5 by Bella1965 from Doubled, tastes great! I doubled the recipe, used evaporated milk instead of whole milk, shredded the fresh ginger instead of chopped. Because I doubled it and our high altitude it was about 45 minutes to reach the softball stage. But otherwise turned out fantastic. I also added some red food coloring, at the beginning but I don’t know if it made a difference , it actually looks chocolaty color, probably from the brown sugar. Rated 5 out of 5 by Carole from So moreish. Made this today and it has turned out better than I had hoped. Patience is the byword, don’t try to rush it. I followed the recipe to the letter and now have some gorgeous fudge, only problem is trying not to eat all before it has completely set. Rated 5 out of 5 by MrsK from Fab fudge This is my go-to recipe. I love the fudge it makes and I've used the basic recipe to change flavours like a handful of dried blueberries, vanilla and stirred in honey all successfully. I heat it to 117 on a thermometer for perfect results every time. Rated 5 out of 5 by Goforitgrandma from YUM. YUM. YUM. Can’t get enough of this delicious fudge. It’s just absolutely a m a z i n g ! !